For most people, Friday is a casual day- so I wanted to show an outfit that is casual- but I still looks like I put a little effort into my look. In my outfit on the right I am wearing jeans, a t shirt and a jacket. It’s a common look I see moms wearing all the time- and let’s face it- there is really nothing very cute about this look! 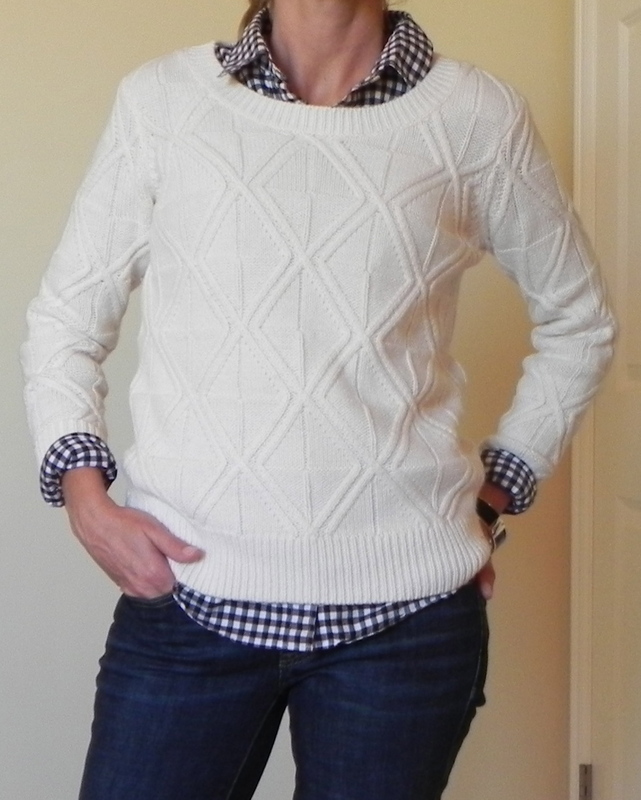 To improve the outfit, I replaced the casual t shirt for a cute checkered shirt– then I added a gorgeous cable knit sweater over the top. I like seeing the collar, sleeves and the tails of the shirt peeking out under the sweater (this look was inspired by Dreaming in Cashemere’s cute outfit seen here). For my jeans I have on these straight leg, dark wash J Crew cropped jeans- and I have replaced my Birks (I do wear these around the house) with black patent flats. As for the finishing pieces, I decided this sweater has so much detail that I felt like it didn’t need a necklace, but I added a cute black bracelet. It’s basically the same style outfit as my before look- but so much cuter, don’t you think? By the way, thank you so much to everyone who took a minute to write yesterday! I loved hearing from everyone what their opinion was on my outfit! I think you all have great points- and I love hearing from you! A close up of the cute details of this sweater. Just take 5 extra minutes this morning and put together an outfit that makes you look and feel great! Oct 13th, All About Me! Me too! I love the look of a creamy white sweater and a pair of cream pants- I think it is such an elegant look- which I will be sporting in a few weeks! Thanks! Look at Old Navy, I got a cute one there this summer!